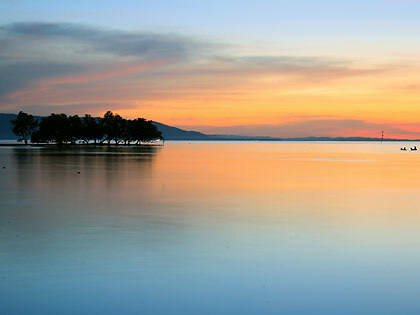 The Spanish called it “Isla del Fuego” (Island of Fire) for the glow caused by numerous fireflies at night. In more recent times Siquijor has become popular among locals for folk healing. More notoriously, stories about witchcraft and sorcery have added to its mystique. Some well-meaning people warned us about travel to the island but that only added to our curiosity about the place. The fact that Siquijor remains off the beaten path for the majority of local travelers further stoked our determination to visit. And so on a balmy December day we were headed south on a flight that would take us to Dumaguete in Negros Oriental and eventually on a ferry ride to the port of Larena, the commercial center of Siquijor Island. To our pleasant surprise there was a complete absence of a Jolibee or MacDonald’s fast food joint that can now be found even in the most remote of places in the Philippines. That speaks volumes of how laid-back Siquijor is. After our arrival at Larena we were soon relaxing under the cool shade of trees at the Kiwi Dive Resort along Sandugan Beach. 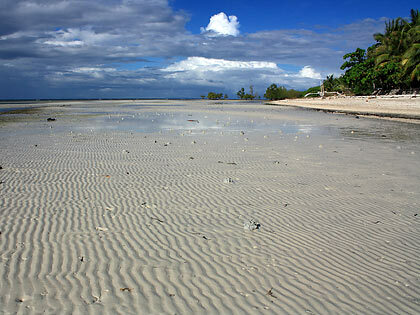 Sand ripples at low tide: Sandugan Beach in Larena, Siquijor. During dinner that night we came across some of the dancing fireflies that led Spanish colonizers to christen Siquijor the “Island of Fire.” However the Spanish could just as well have been referring to the fiery sunsets on the western side of the island. For two nights we were witnesses to some pretty stunning sunsets at Sandugan Beach – and the locals told us that the sunsets here would have been even more spectacular had there been a bit more cloud cover. 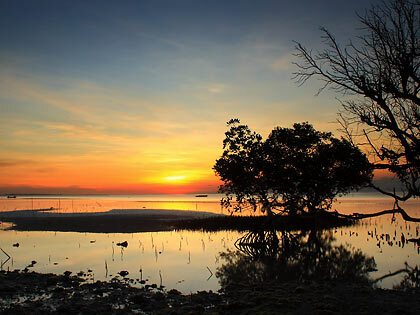 Sunset among the mangroves, Sandugan Beach, Larena. We spent two days roaming around the island on a trike with Dondon, our driver who doubled as tour guide. You can easily cover the whole island in a day as the driver-guides take you through a set itinerary. We had two days however, so we got to visit more than the usual spots although we ignored some of the more established stopovers such as the centuries-old balete tree in Lazi and the Capilay Spring Park in San Juan. There are only 6 towns in Siquijor, the third smallest province in the country. Even then there are just too many interesting places to see in Siquijor for a one-day tour. Larena, as previously mentioned, is home to Sandugan Beach. There are dive spots in this town and in the adjacent municipality of Enrique Villanueva. Siquijor’s main highway passes primarily along the coast in both towns so we were treated to magnificent views of the beach. 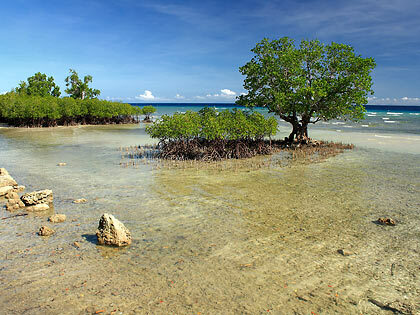 The most noticeable thing about Larena and Enrique Villanueva is the abundance of mangrove trees on the coastline. Many of these mangrove areas are now protected natural habitats or marine sanctuaries. Mangrove trees along Enrique Villanueva’s coast. There is a concentration of resorts in Larena, particularly at Sandugan Beach. Many are owned by foreigners married to locals. We immediately realized that while Siquijor may not be so prominent on local tourist maps, foreign tourists – especially Europeans – are a familiar sight here. After Enrique Villanueva, the town of Maria was next on our list. 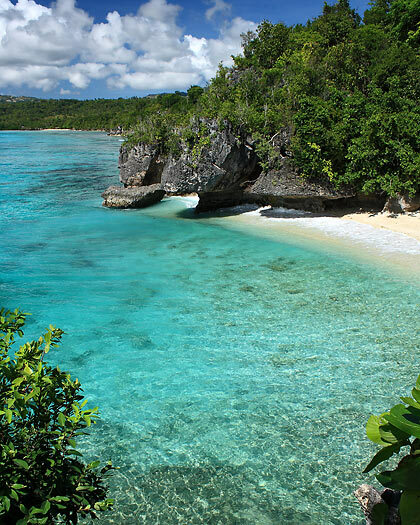 Easily the most famous destination here is Salagdoong Beach with its white sand and crystal-clear turquoise waters. We felt that some structures built by the local tourism authority here almost ruined the beauty of the place. The dive platform at a vantage point, however, does provide panoramic views of magnificent Maria Bay. View of Salagdoong Beach and its turquoise waters from the diving platform area. 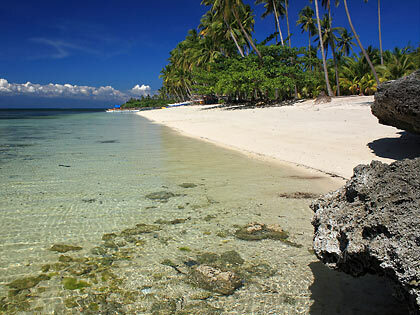 Further down south from the Maria poblacion and just before the town of Lazi is Kagusuan Beach, a white-sand beach surrounded by emerald-green waters. It’s a deserted but beautiful beach with no resort in sight. We could have easily spent hours just lazing away here. Kagusuan Beach is located well off the main highway and one can easily get lost trying to find it without a local guide. We were the only persons on the beach until a lone European tourist arrived on a motorbike. Deserted Kagusuan Beach in Maria. The last town on our first day of tour was Lazi  a municipality on the southernmost portion of Siquijor. A visit to the town proper brought us to the San Isidro Labrador Church, a fine example of local baroque architecture and a candidate for inclusion to the UNESCO World Heritage Site list. Across the street from the church is the San Isidro Labrador Convent, one of the oldest and biggest in Asia. There is also a museum inside the convent. 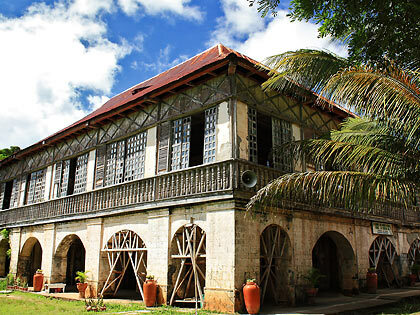 Besides its numerous natural attractions, Siquijor also has several old, well-preserved churches that could easily make it to the list of the Philippines’ national treasures, as some of them already are. San Isidro Labrador convent near the poblacion or town center of Lazi. 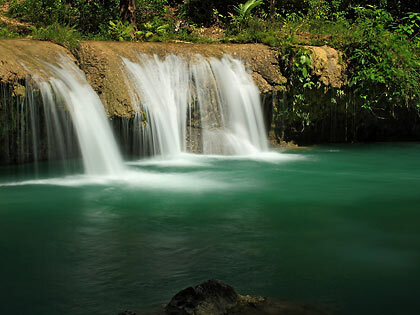 A short drive north from Lazi’s town center is multi-tiered Cambugahay Falls with its cool mountain spring water and turquoise-colored catch basins. The entrance to Cambugahay Falls is located right along the road from Lazi town proper although we had to descend a 135-step concrete walkway to get to the bottom tier of the falls (that was the easy part; it was the return trip back up that was taxing). At the third level of multi-tiered Cambugahay Falls in Lazi. Our first day tour took us to the eastern part of the island so obviously the second day’s itinerary was for the western side. From our base in Larena our trusty guide and driver Dondon took us to the capital town of Siquijor. 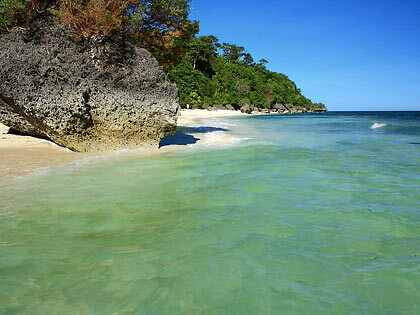 Along the coastal road are several white sand beaches such as Candanay Sur, Candanay Norte, Tambisan and Dumanhog. There are also several resorts located right on these beaches. After consulting with Dondon we settled for Dumanhog Beach. does not charge for access to the beach) to get here. To be honest, we were not particularly impressed by Dumanhog Beach given the quality of the beaches we had seen on our first day of touring. Perhaps it was because we chose to visit in the morning when the tide was low and the beach was high and dry with debris brought in by the amihan or northeast monsoon very visible on the beach. In fairness though the sand here is fine and creamy white and would have made for a near-perfect beach scene at high tide. 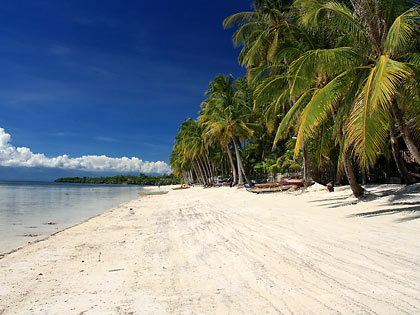 What is pretty impressive about Siquijor is the beach beside its port where the Das Traum Guesthouse is also located. We got here again at low tide which exposed a wide swath of fine, blindingly white sand beach. At high tide, however, the views are even better with varying shades of turquoise and aquamarine waters, leading many to dub this as the best looking port in the country. We could not agree more: how many ports do you actually see with a beach resort alongside? Siquijor town and its beaches were only a prelude to the concentration of beaches that lay before us in the town of San Juan. This town has an almost unbroken string of white sand beaches and the densest concentration of resorts on the island. We selected two beaches to spend time here: Paliton Beach and the Poblacion San Juan Beach in front of Coral Cay Beach Resort. Paliton Beach is the first of a long string of beaches in San Juan, but unlike the others there are no resorts on most stretches of its fine white sand. The Danish Lagoon is the lone resort in this area and it lies at Paliton’s southern end. Paliton has also been declared a marine sanctuary and is home to three submarine caves and a cathedral wall. Even at ankle-deep water we could already see fishes playfully zipping about. Coral rocks and a long line of coconut trees lining the beach make for a classic tropical seascape. Paliton for us is one of the best beaches in the island. The beach in front of Coral Cay Resort in San Juan. 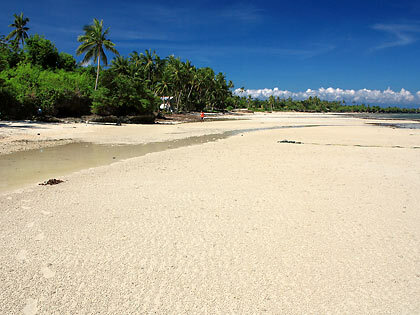 The beach in front of Coral Cay Resort (otherwise known as Poblacion San Juan Beach) is typical of the long line of white sand beaches that begins here and ends somewhere near the Coco Grove Beach resort in Barangay Tubod. There’s plenty of good diving here as well, especially at Maite Point and at the Tubod Marine Sanctuary in front of Coco Grove. San Juan’s beaches are also known for spectacular sunset views. Peaceful sunset at Sandugan Beach, Larena. San Juan was the last stop in our two-day island tour although we did drop by again at Siquijor port to see if the high tide would have made for a better photo of the beach but realized it was still too early in the afternoon. We spent the rest of the day resting blissfully underneath the shade of trees at Kiwi’s Dive Resort and afterwards exploring Sandugan Beach’s extremities late in the afternoon. We finally left Siquijor the following day on a morning ferry that would take us to Dumaguete. Waiting for our flight back to Manila in Dumaguete, we reflected on how so many attractions could be packed into so small an island. 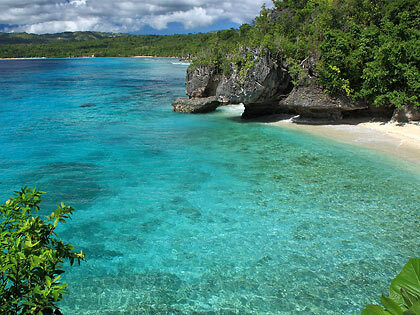 Siquijor is indeed magical but not really for the reasons we have heard before. Its laid-back charm, friendly people, postcard-perfect white sand beaches, diverse marine life, well-preserved forests, old churches, cool waterfalls and fiery sunsets combine to make Siquijor truly a magical island… of fire. At Dumaguete port there are several ferries bound for Siquijor town or Larena. You can choose between the fast ferries such as Delta Fast Ferry or Ocean Fast Ferry that can make the trip in 45 minutes to an hour or the roll-on, roll-off (RORO) ferries that take vehicles on board and can take almost 2 hours to make the trip. These ferries leave as early as 5:30 AM and as late as 7PM. The schedules for travel times can change so you may need to check elsewhere if you are particular about knowing the exact time these ferries depart for Siquijor. We would have taken any of the fast ferries but to our surprise they were not available on the day we arrived in Dumaguete. We ended on board a Montenegro Lines ferry to Larena. (Going back we took GL Lines which was several minutes faster than Montenegro but still not as fast as Delta or Ocean.) Several ferries also come from Cebu or Bohol, stopping over at Dumaguete before continuing on to Siquijor. 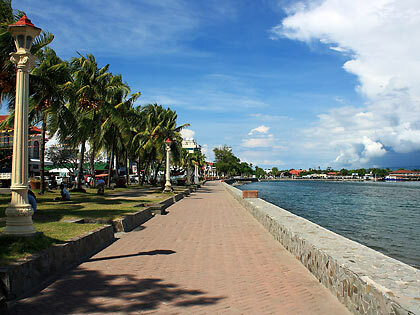 Rizal Boulevard in Dumaguete with Dumaguete port in the right background. From the ports at Siquijor or Larena you can take a trike to your resort of choice. Trike drivers will charge you anywhere from P150 to P250 (or even P350) depending on where you are staying. We thought this to be too much initially but later learned that trike drivers charge P11 per person for a one-way regular trip. Since they usually take 6 people on each trike, this totals P66 per person or P132 for a 2-way trip. We ended up eating first at a resto in Larena (outside the port area) then chartering a trike for P100 to take us to Kiwi’s. Where to Stay. There is a wide range of resorts to choose from beginning with budget accommodations such as Lorna’s End of the World Resort in Lala-o, San Juan (P400 for beachfront rooms) and Das Traum Guest Haus near Siquijor port (P700 for air conditioned rooms with cable TV) to flashier, higher end resorts such as Coco Grove Beach Resort in San Juan (P2,700 for a standard room; P8,700 for a suite villa with Jacuzzi). There are also several places of stay for backpackers such as JJ Backpackers Village in Solangon, San Juan. We were surprised by the density of the resorts in this island. The greatest number of resorts are in the beaches of San Juan proper but there are also concentrations of resorts along Siquijor town’s coast and around Sandugan Beach in Larena. We chose Kiwi Dive Resort in Larena for its nice gardens (and shade) and relatively low rates (P690 for a beachfront cottage plus P300 if you want to use the air conditioning). It’s also not as busy as San Juan. Sandugan Beach in front of Kiwi Dive Resort, Larena. Getting Around. As we mentioned earlier you can tour the island in one day. This is possible because the circumferential road that spans all of the island’s 6 towns is just 75 kilometers long and passes mainly along the coast. You can rent a trike for P800 to P1,200 for a whole day tour (again this depends on where you are going) – with your driver acting as a tour guide as well. You can also rent a motorbike (P800 or so for a whole day) and go wherever you wish. 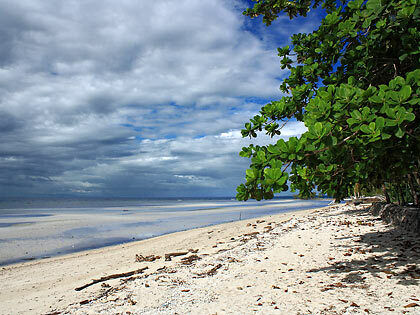 The only setback is that you may not know the way to lesser known destinations such as Kagusuan Beach in Maria. We chose to go around the island in 2 days from our base in Larena. The first day was spent touring the eastern half of the island (Enrique Villanueva, Maria and Lazi) and the scond day the western half of the island (Larena, Siquijor town and San Juan.) We spent P800 for each day plus a tip for our driver and guide.